Dubai: Investors are taking a fancy to bonds and trimming exposure to equities, a trend which could carry last week’s volatility over into this week. The new found preference for bonds is linked to rising interest rates. Equities have been fraught with economic, geopolitical risks, and any investments would depend on the clients’ risk appetite, experts say. Better than expected data points from the US have been pointing to a sustained economic recovery, which analysts feel may push up interest rates even higher, despite US President Donald Trump’s feelings that the Federal Reserve was ‘going loco’ with rates hikes. The short-term US treasury yields have been rising to multi-year highs, with the two-year yield hitting a high of 2.907 per cent, its highest level since June 25, 2008. The two-year treasury yields was at 1.9 per cent at the start of the year. The 10-year US treasury yield was at 3.18 per cent on Friday, about 3 basis points below highs not seen since 2011. However, the Dow Jones Industrial has yielded negative returns in the month so far, registering a 4.86 per cent decline. The index has been in a multi-year bull run since 10 years. “There is a trend of clients shifting from equities and locking profit and shifting to bonds where they can find attractive yields with exposure to high quality companies,” Nadi Bargouti, head of asset management at Emirates Investment Bank told Gulf News. Equities have been fraught with economic, geopolitical risks, and any investments would depend on the risk appetite of clients, experts say. That does not mean global equities are less attractive, as UBS still has overweight position on the asset class thanks to a supportive backdrop in terms of valuations and amid a recovery in the US economy. “Equity markets have been volatile over the past month, with stocks undermined by a rise in the 10-year Treasury yield and concerns about trade tariffs,” said Mark Haefele, global chief investment officer at UBS. “The recent rise in bond yields is moving us from a TINA (There is no alternative) to a TIARA (There is a real alternative) market. While investors now have some fixed income alternatives to equities, we do not consider them attractive enough yet to warrant underweighting equities relative to fixed income,” Haefele said. One of the emerging markets (EM) that Emirates Investment Bank is positive about is China. “Within EM, we are looking at China after the markets there were sold off indiscriminately. We like the general economic fundamentals. China is undergoing a transformation, which will pan out well,” said Bargouti. They have increased allocation to China now compared to what it had a few weeks ago. “We stay in single digit, and we significantly overweight,” Bargouti said. Chinese benchmark the Shanghai Composite has shed more than a fifth of its value so far in the year due to slowing growth and tariffs on US-China trade. 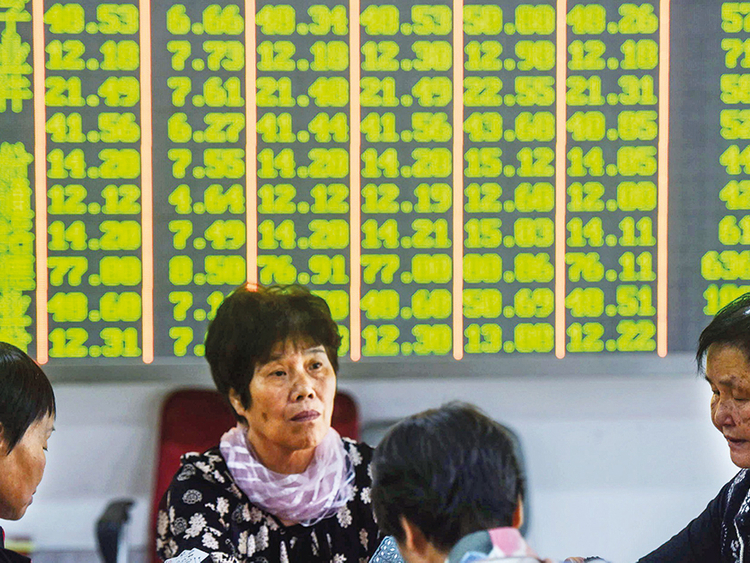 The decline compares with an 11 per cent fall on the Asia Dow index. EIB is also looking into Mena equities due to attractive dividend yields that the stocks have to offer. “Dividend yields are reaching attractive levels. The fundamentals and valuations are getting attractive. We are looking at the market closely to start building positions gradually,” Bargouti said. The Dubai Financial Market has underperformed the regional and emerging market peers, with the Dubai index falling 18 per cent so far in the year.